Brian Henry has published nine books of poetry, most recently Brother No One (Salt Publishing, 2013). He has translated Tomaž Šalamun’s Woods and Chalices (Harcourt, 2008) and Aleš Šteger’s The Book of Things (BOA Editions, 2010), which won the 2011 Best Translated Book Award. We went Behind the Sestina with Henry to discuss “Bad Apple,” which is featured in The Incredible Sestina Anthology. 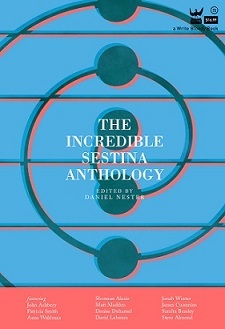 The first sestina I read was probably in Elizabeth Bishop’s Complete Poems, which I read for a literature course in college. I’ve written quite a few sestinas before and after this one. My earlier sestinas were exercises within the form; my later sestinas were attacks on the form. This is one of my later ones. Can you describe writing this sestina? Did the subject matter of the sestina have an impact on the form used, or did the form have an impact on what you were writing about? I wrote this sestina in 2002. I wanted to write a poem by writing a stanza a day. I didn’t sit down to write a sestina, but on the second day, the end word of the first line happened to match up with the end word of the previous line, and the sestina just started to happen. On the third day, though, I decided to make the sestina itself the subject. Did you really write a stanza a day for a week? Does the decaying apple symbolize the passage of time? I did. The apple in the title relates to the idiom “one bad apple spoils the barrel.” I thought it spoke to the construction of a poetic form like the sestina. All of my sestinas would be dedicated to Hayden Carruth, who once visited my poetry workshop in graduate school and said that any sestina not written in iambic pentameter is a fake sestina. This entry was posted in Behind the Sestina and tagged Arts, bad apple, Behind the Sestina, brian henry, form, poem, Poetry, Sestina, The Incredible Sestina Anthology. Bookmark the permalink.